One of the most-hyped teams in motorsports right now is the return of Team Joest—the team who helped Audi completely dominate Le Mans for years. 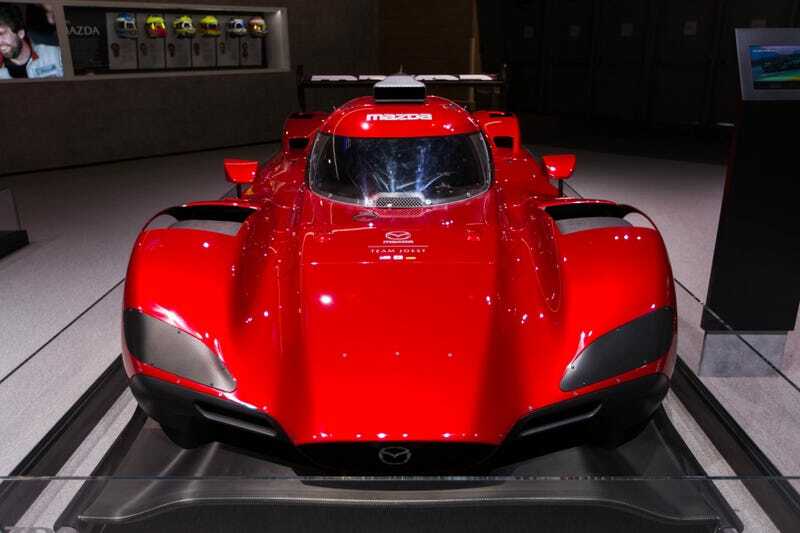 Joest is now helping Mazda’s struggling IMSA team get it together, and this is their gorgeous car for next year, the revised RT24-P. Three words: it better deliver. The RT24-P debuted last year, but like other recent Mazda IMSA efforts, it didn’t perform all that well in races. So, they quit mid-season to rework the car, teaming up with the guys you probably remember from the Truth in 24 films: Team Joest. Mazda showed off their 2018 DPi-spec IMSA WeatherTech Sports Car Championship car at the LA Auto Show, and hot dang, it is pretty. The car will keep this “soul red crystal” hue for 2018, but sponsor and series decals will be added before it’s ready to race, as well as some lights where those block-off plates are at the moment. While the shape of the car remains largely the same as last year’s RT24-P, a team representative estimated that about 60 percent of what’s underneath that curvy bodywork is new. Cooling was reworked to focus on endurance and reliability over high speed—hopefully so we see fewer Mazda car-b-ques this season. The suspension was improved for a more balanced car. Other tweaks were simpler, like going to a lighter wiring harness and finding other places to save weight. The team beefed up their driver line-up for 2018 as well. Longtime Mazda drivers Jonathan Bomarito and Tristan Nuñez will keep driving Mazda’s two RT24-P cars for the full season with help from World Endurance Championship Ford GT driver and 2014 Le Mans LMP2 class winner Harry Tincknell and former Audi Sport Team Joest driver Oliver Jarvis. IndyCar driver Spencer Pigot and 2017 DTM champion René Rast will join the team for the longer races on the 2018 calendar. Of course, Mazda Team Joest isn’t showing off much of what’s under that shiny red skin just yet, as its debut at the 24 Hours of Daytona may have one of the most insanely competitive fields in years. Acura’s back with a factory-backed Team Penske effort, and two Formula One drivers are now coming over to drive. Mind you, the top Prototype class already gave us one of the most epic passes in ages last year. IMSA next year is going to rule. CORRECTION [5:16 p.m.]: Tincknell is basically our new hero, as he will continue driving the Ford GT in the WEC next year in addition to taking this ride. This has been corrected above.